Pedro Brugada and his two brothers, Josep and Ramon, described this syndrome in 1992. The syndrome is characterized by a rather peculiar ECG and the patients experience syncope, life-threatening ventricular arrhythmias, cardiac arrest or even sudden cardiac death. The Brugada brothers also noted that the syndrome – which was named the Brugada syndrome – appeared to be hereditary, since many patients reported a family history of the same symptoms and events. Perhaps the most distinguishing feature was the characteristic ST segment elevations in leads V1–V3. The prevalence of Brugada syndrome remain largely unknown. Available data suggest that it is most common in Asia, particularly Thailand. It is believed that the prevalence in Caucasian populations is approximately one in ten thousand individuals. Men are affected roughly ten times as often as women, and men also display the highest risk of experiencing malign ventricular arrhythmias. 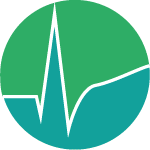 Brugada syndrome is hereditary with autosomal dominant inheritance patter, meaning that only one mutated gene is necessary to develop the disorder. Till now (2016) more than 12 genetic mutations have been associated with the Brugada syndrome. These mutations are located in genes encoding potassium and calcium channels of the outer cell membrane. Hence, the Brugada syndrome is a highly malignant disorder which must be recognized by any health care provider. A family history of any of the above listed symptoms and manifestations must always raise suspicion of serious hereditary arrhythmias. Although clinicians are becoming increasingly aware of the Brugada syndrome, the diagnosis is still missed despite obvious clinical presentation. Arrhythmogenic right ventricular dysplasia/cardiomyopathy (ARVC/ARVD) – ARVC also tends to manifest in young adults and the most common symptoms are palpitations (prevalence 40%), syncope (30%), sudden cardiac death (15%), atypical chest pain (30%) and dyspnea (10%). The major ECG findings in ARVC are T-wave inversion in V1–V3 (in absence of right bundle branch block); virtually all patients display this. The epsilon wave, which is much less common (one third of patients), is defined as a wave occurring on the initial part of the ST segment. Hyperkalaemia may cause ST segment elevations in V1–V3 that resemble those in Brugada syndrome. This disorder is easy to diagnose with a simple blood test and the ST segment elevations resolve after normalization of potassium levels. Brugada-like ECG changes may occur transiently after electrical cardioversion. Early repolarization also presents with J point elevation (as does Brugada syndrome, see below) and may also lead to syncope, ventricular arrhythmias and even sudden cardiac death. However, the ECG changes in early repolarization are easy to separate from those in Brugada syndrome and the risk of ventricular arrhythmias and sudden cardiac death is considerably lower than the risk among patients with Brugada syndrome. It follows that Brugada syndrome is a likely diagnosis in patients presenting with these symptoms and typical ST-segment elevations in V1–V3 (see below). 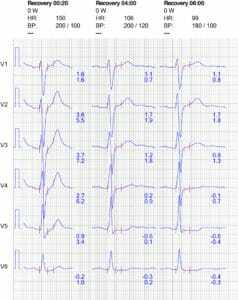 The characteristic ECG changes may be intermittent, which is why the diagnosis may be missed. 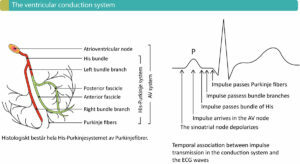 For unknown reasons the ECG changes – as well as arrhythmias and deaths – occur more frequently during rest, sleep, fever and situations with high vagal tone. Interestingly, physical activity does not appear to provoke the arrhythmias, which distinguishes Brugada syndrome from other channelopathies (e.g long QT syndrome (LQTS) and arrhythmogenic right ventricular dysplasia/cardiomyopathy (up to 80% may experience the ventricular arrhythmias during physical exercise). If Brugada syndrome is suspected, the ECG changes may be induced pharmacologically during controlled circumstances. 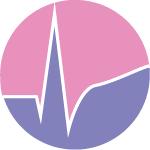 Sodium channel blockers (ajmaline, flecainide) are administered intravenously, with defibrillator and resuscitation capabilities prepared, to produce the ECG changes. It should be noted that the list of drugs and disorders that may induce Brugada ECG (and thus risk of arrhythmia) is much longer, and includes beta blockers, cocaine, hypercalcaemia etc. This list is continuously updated and maintained at www.brugadadrugs.org. Figure 10. 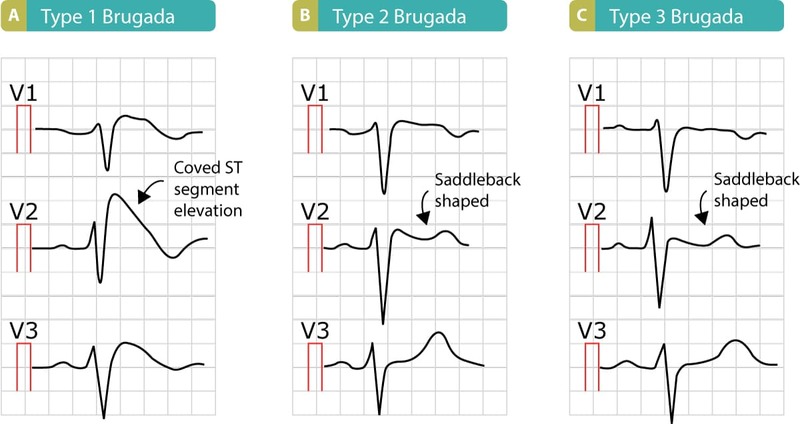 ECGs presenting Brugada syndrome type 1, type 2 and type 3, respectively. The Brugada syndrome may present with three different ECG patterns, referred to as type 1, type 2 and type 2 Brugada syndrome ECG. The most typical, and diagnostic, is type 1 Brugada syndrome. It features large coved ST-segment elevations and T-wave inversions in leads V1–V3. The coved ST-segment elevations may resemble a shark tale. Refer to Figure 1, panel A. 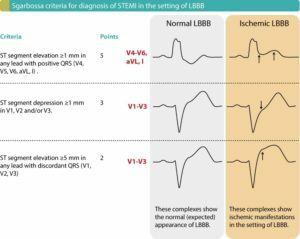 These ECG changes must not be confused with right bundle branch block, as such a mistake may be devastating for the patient. Prospective studies show that type 1 Brugada syndrome has the strongest correlation with future risk of ventricular arrhythmias and cardiac arrest. Note that the ECG changes are dynamic in patients with Brugada syndrome. Most patients actually have normal ECG during the majority of the time but they convert to the Brugada ECG patterns spontaneously. As noted above, certain drugs (www.brugadadrugs.org) and situations (sleeping, rest, fever) may also induce the ECG changes. The patient may display all three types of Brugada ECG, even during the same ECG recording. Type 1 Brugada syndrome: Coved ST segment elevation ≥2 mm which continues in T-wave inversion in lead V1 and/or V2. This pattern establishes a diagnosis of Brugada syndrome (i.e no other examinations are warranted). Note that the electrodes to lead V1 and V2 may be placed in the second, third or fourth intercostal space in the pursuit of these ECG changes. Refer to Figure 1. Type 2 Brugada syndrome: Saddleback shaped ST segment elevation with J point elevated ≥2 mm in leads V1 and/or V2. The terminal portion of the ST segment is elevated ≥1 mm. Type 3 Brugada syndrome: Similar to type 2 criteria but the terminal portion of the ST segment is elevated <1 mm. Note that it is allowed to record the 12-lead ECG with the electrodes of leads V1 and V2 placed in the second, third or fourth intercostal space in order to maximize the probability of detecting the ECG changes. This maneuver is recommended in available consensus documents. With respect to type 2 and type 3 ECG pattern, a diagnosis of Brugada syndrome is only established if the patient converts to type 1 ECG pattern upon administration of class I antiarrhythmic drugs (this is tested in the electrophysiological laboratory, under controlled circumstances). It is motivated to screen family members of patients with Brugada syndrome. It is also motivated to acquire ECG in all patients whose clinical characteristics raises suspicion of Brugada syndrome. Currently there are no other indications for screening. The risk of syncope, life-threatening ventricular arrhythmias, cardiac arrest and/or sudden cardiac death is very high in patients with Brugada syndrome. The risk is greatest during sleep, at rest, during fever and situations with high vagal tone. The ventricular tachycardia is polymorphic. Moreover, the risk is highest in patients displaying the type 1 ECG pattern. For unknown reasons, up to 20% of patients with Brugada syndrome develop supraventricular tachyarrhythmias, such as atrial fibrillation (AVNRT and WPW has also been described). Some minor lifestyle changes are warranted. Excessive alcohol consumption is believed to be pro-arrhythmic and should therefore be avoided. The patient must not use any medication which may induce arrhythmias; the list of these drugs is extensive and a continuously updated list is available at www.brugadadrugs.org/drug-lists/. Prospective studies show that the use of ICD may be highly beneficial in selected cases of Brugada syndrome. The ICD prevents sudden cardiac death och thus increases survival. However, ICD is not indicated in individuals with asymptomatic Brugada syndrome (regardless of ECG pattern) because the risk of sudden cardiac arrest is very little. Patients who have survived cardiac arrest should have an ICD. Patients with documented sustained ventricular tachycardia should have ICD. Patients with type 1 Brugada ECG and a history of syncope may be benefitted by an ICD. Thus, an ICD should be considered. Patients with inducible ventricular fibrillation during invasive provocation (stimulation during electrophysiological study) may be benefitted by an ICD. Thus, an ICD should be considered. Hence, ICD is not indicated in asymptomatic individuals, regardless of ECG pattern. ICD is neither indicated based upon family history of events. However, when an ICD is under consideration, one should include family history in the risk stratification. Quinidine reduces the incidence of ventricular arrhythmia in patients with Brugada syndrome. This drug may be considered in patients with 3 or more episodes of ventricular fibrillation or ventricular tachycardia within 24 hours. Quinidine should also be considered in patients who wish not to have an ICD or have contraindication for use of ICD. Priori et al: Executive summary: HRS/EHRA/APHRS expert consensus statement on the diagnosis and management of patients with inherited primary arrhythmia syndromes. Antzelevitch et al: Brugada Syndrome: Report of the Second Consensus Conference.